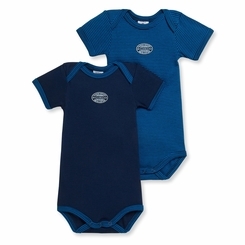 This set of 2 baby boy's short-sleeved bodysuits is comprised of one plain bodysuit and one striped milleraies bodysuit. The label "marque d�pos�e milleraies" is stamped on both undergarments. Note the practical detailing on these bodysuits: the envelope neck that simplifies dressing baby, and the snaps at the crotch. A set of baby bodysuits that playfully displays Petit Bateau icons.